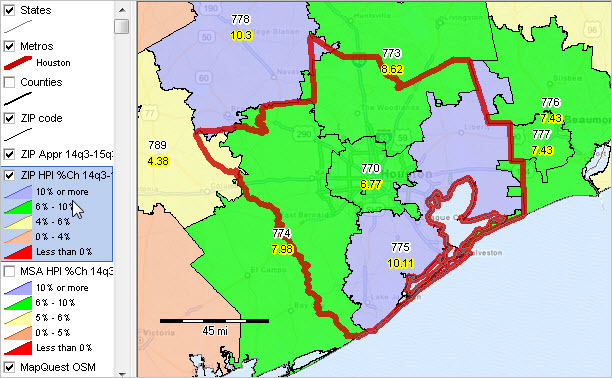 .. housing value appreciated by 6.77% in the Houston 3-digit ZIP code 770 from the third quarter 2014 through the third quarter 2015 .. how has housing value appreciated in areas of interest during 2015? Use the Housing Price Index (HPI) to examine quarterly or annual housing value appreciation by 3-digit ZIP code, metro or state. The HPI is calculated in part using home sales price information from Fannie Mae- and Freddie Mac-acquired mortgages. The U.S. HPI all transactions, non-seasonally adjusted, value increased by 5.5 percent from 2014Q3 to 2015Q3. Use the interactive table in this section to compare and contrast HPI quarterly data for/among all metropolitan statistical areas, states and the U.S. Use the GIS tools and data resources reviewed in the related Web section to visually examine and map these data. Install the GIS project on your computer; add your own data. The following graphic shows housing value appreciation 2014Q3-2015Q3 by 3-digit ZIP code based on the HPI. Click graphic for larger view and details. • View developed using CV XE GIS and related GIS project. • Interactive table coming in December. for 3-digit ZIP code 770; housing appreciation 6.77% 2014Q3-2015Q3. The HPI alone provides only partial insights. Evaluation of housing markets, and the regional economy, trends and patterns need to use the HPI in combination with many other measures. • 2010-2014 annual population estimates: county, metro, state, U.S.
• ACS 2014 1-year demographic-economic tables: county, metro, state, U.S.
• Each data resource section has associated GIS project & datasets. Use tools in this section to examine the quarterly HPI from 2014Q3 to 2015Q3. View/rank/compare HPI trends using the interactive table (see below). Use the GIS tools to visually and geospatially analyze patterns and characteristics of interest. Members of the ProximityOne User Group may download the HPI GIS project and use this project and datasets with the CV XE GIS software. Develop variations on maps shown in this section; add your own data. Register for information on Metro Housing Market Reports. Updated quarterly, these reports provide a comprehensive housing market assessment and outlook for the U.S. by metro with geographic drill-down (tract and ZIP code) within individual metros. The following graphic shows housing value appreciation 2014Q3-2015Q3 by metro (MSA) based on the HPI. Click graphic for larger view and details. – User Group (join now) members: use HPI GIS project with CV XE GIS. The graphic shown below illustrates use of the interactive table to rank metros on the 2014Q3 to 2015Q3 quarter-to-quarter housing appreciation. Two Florida metros, Port St. Lucie and Palm Bay-Melbourne-Titusville, FL, led the nation. Use the interactive table to examine areas of interest. Join me in a Data Analytics Lab session to discuss use of these data using analytical tools and methods applied to your situation. 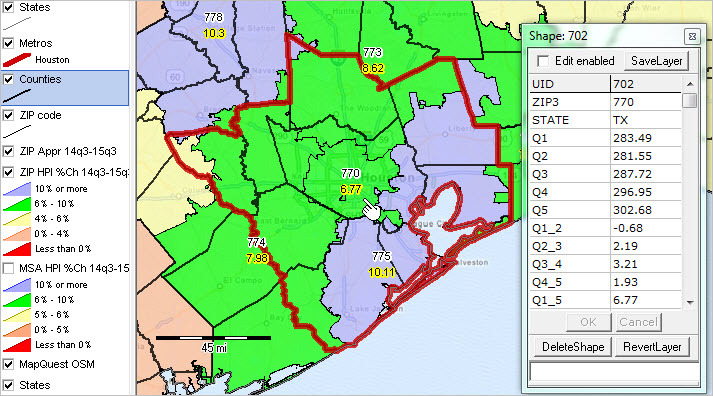 The HPI updates quarterly for 3-digit ZIP codes, metropolitan statistical areas and other geography. The next update is scheduled for revisions and the new 2015Q4 on February 25, 2016. See in calendar and set a reminder. Follow my blog (click button in upper right column) where I will review related market topics, using other data resources and analytical tools available to you at no fee. Upcoming topics include an update on Low & Moderate Income by Census Tract and the Rental Vacancy Rate access, interpretation and role as a leading economic indicator. .. HPI quarterly update … use the Housing Price Index (HPI) to examine quarterly or annual housing value appreciation by metro or state. How is housing value appreciation changing among metros of interest? The HPI is calculated in part using home sales price information from Fannie Mae- and Freddie Mac-acquired mortgages. The U.S. HPI all transactions, non-seasonally adjusted, value increased by 5.25 percent from 2014Q2 to 2015Q2. During this period the Sebastian-Vero Beach, FL MSA experienced the highest rate of housing value appreciation among all metros. Use the interactive table to compare and contrast HPI quarterly data for/among all metropolitan statistical areas, states and the U.S. Use the GIS tools and data resources reviewed below to visually examine and map these data. See related Web section for more detail. The following graphic shows housing value appreciation 2014Q2-2015Q2 by metro based on the HPI. – click graphic for larger view and details; view developed using CV XE GIS. – Use the HPI GIS project with CV XE GIS software; create different views. – view/analyze different HPI measures; zoom-in; add labels. – apply queries; add other geography/data. – create views/graphics for reports and stories. Use the interactive table to view/rank/compare the non-seasonally adjusted “all transactions” HPI for the most recent 5 quarters for all Metropolitan Statistical Areas (MSAs), states and the U.S. The graphic shown below illustrates the start-up view of the table. The blue highlighted value shows the U.S. national annual change 2014Q2 to 2015Q2. The following graphic illustrates how the table can be used to 1) select only metros and 2) rank metros in descending order based on annual change 2014Q2-2015Q2. The Sebastian-Vero Beach, FL MSA experienced the highest rate of housing value appreciation among all metros. The HPI provides one part of a larger picture of demographic-economic conditions and trends. Join me in Data Analytics Lab sessions where we explore the mechanics of making the HPI thematic pattern view shown above. Examine the process of integrating other data. Create variations of this view or entirely different visual analysis GIS projects.